Here's some food for thought. I think it's very interesting. Notice in the song by The Eagles, HOTEL CALIFORNIA that the lyrics mention that they stab it with their steely knives, but they just can't kill the Beast. Now read what the Bible says concerning the Antichrist, the Beast, in Revelation 13:2-4 . . . The Antichrist will be wounded, almost to death, but will survive. This is exactly what The Eagles' are singing in their song. Coincidence? I think not. There is no denying that the “Beast” is the Antichrist according to Revelation 13:2, unto whom the Dragon, the Devil, will give him POWER, a SEAT and great AUTHORITY. Notice in Revelation 13:4 that the masses of the earth will worship the BEAST (Antichrist) and the DRAGON (Satan). This has already been happening for decades. Satan is worshipped at every rock concert. That's what rock concerts are! These lyrics to the GOD OF THUNDER song are so offensive that the CD Universe website has blocked out the lyrics as a hidden track. It is sickening that Gene Simmons is paid millions-of-dollars for his disgusting life to be featured on cable TV in a show called, FAMILY JEWELS. One of the lead singers of the super popular band JEFFERSON STARSHIP, Grace Slick, released her own solo album in 1980 titled “DREAMS,” featuring the hit satanic song, “El Diablo.” Stevie Nicks of the band FLEETWOOD MACK has been called “The White Witch,” and Grace Slick of JEFFERSON STARSHIP, “THE DARK WITCH.” El Diablo is the Spanish word for “DEVIL”! In this song Grace Slick sings the lyrics . . .
Few people are aware that most of Elton John's songs were written by a Warlock (a male witch), named Bernie Taupin. Even Brian Wilson, lead singer of the All-American west-coast hit band, THE BEACH BOYS, admitted in an interview that they were trying to make “WITCHCRAFT MUSIC” in the 1960's while experimenting with the mind-altering psychedelic drug LSD. Three of the four members of the legendary band, THE BEATLES, have publicly admitted to using the drug LSD. Jim Morrison of THE DOORS and his wife, Patricia Kennealy were both witches. The Beast and the Dragon are already being worshipped. Tragically, Marilyn Manson's band of the same name has sold 11,000,000 albums just in the United States. In the U.S. alone, three of the band's albums have been awarded platinum certification, three more gold, and the band has had three releases debut in the top ten, including two number-one albums. Why should God bless America? God is greatly to be feared by those who rebel against Him. Hebrews 10:27, “But a certain fearful looking for of judgment and fiery indignation, which shall devour the adversaries ... It is a fearful thing to fall into the hands of the living God.” By the fear of the Lord, men depart from evil. Proverb 16:6, “By mercy and truth iniquity is purged: and by the fear of the LORD men depart from evil.” Amen! As a solo artist, Osbourne has sold more than 35 million records worldwide, bringing his cumulative sales to more than 60 million albums. 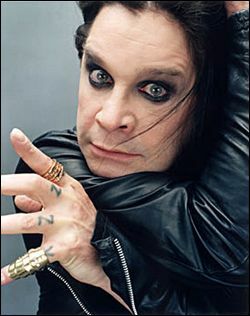 Osbourne is currently visible on the smash MTV series “The Osbournes,” a melding of reality show, soap opera, and sitcom that follows the lives of Ozzy and his family. It recently became the highest rated original program in MTV's 24-year history. "The Ultimate Sin" album is released. Once again, Ozzy ran into trouble with the looks of his album cover. The original cover had 3 crucifixes atop a hill in the background and the girl had no pants on. Ozzy had actually written a whole album before the 'Ultimate Sin,' but scrapped the whole thing and started from scratch because he wasn't happy with it. The album hit hit #8 in the U.K. and #6 in the U.S., and eventually went double platinum. A girl with no pants on in front of 3-crosses? This is the sick mind of Ozzy Osbourne! Yet, millions of Americans idolize Ozzy and have made him filthy rich from buying his works of darkness. Americans are mentally-ill to support such bizarre, demonic and crazy entertainers. As another tribute to the perverted Pagan god of Pan, the movie Pan's Labyrinth has become extremely popular, even being recommend by ChristianityToday and receiving 4-stars from them, go figure. They should rename their organization to ApostasyToday! It doesn't come as a surprise that apostate Billy Graham is the founder of ChristianityToday. Did you read that... “DONE A DEAL WITH THE DEVIL.” Please watch the video sermon by Pastor Danny Castle, THEY SOLD THEIR SOUL. Also, watch ROCKUMENTARY by Pastor Luke Lefebvre. 1st Kings 21:20, “And Ahab said to Elijah, Hast thou found me, O mine enemy? And he answered, I have found thee: because thou hast sold thyself to work evil in the sight of the LORD.” EVERY famous rock band SELLS THEIR SOUL to become world famous. The bands who still aren't inducted into the Rock Hall Of Fame 40 years later is because they failed to promote Satan as much as they could have in the eyes of the cult members who own and control the entire music and entertainment industries. Heavy-metal albums are considered offerings to Satan, and the fans are the sacrificial lambs. I first learned this from hearing Dave Mustaine of MEGADETH refer to his album as “an offering.” Of course, MEGADETH is notoriously Satanic in origin, rubbing shoulders with VENOM and SLAYER. I sincerely believe that mega-famous Rock singers make a dirty-deal with the Devil, which cannot be broken on pain of death, being sued, or being framed and/or blackmailed and sent to prison, totally ruined. You don't go back on an occult-deal that elevates you to superstar status. There's a price to pay in Satan's game. Sin ALWAYS has an enormous price tag, which will cost you dearly. Sin always takes you farther than you planned to go, costs you more than you wanted to pay, and keeps you longer than you intended to stay. Serving God has a price-tag too, but the Lord has PROMISED to repay us bountifully with happiness and eternal blessings. Serving God is so much better than serving the Devil. I was thinking about JUDAS PRIEST the other day and how they travel around the world, performing their works of darkness for millions of fans. That's the works of their mind, heart and hands. I then thought about my online ministry and how many people have been saved by faith in Christ Jesus, and how many lives have been turned toward God and have woken up to the truth about so many issues. I thank God that I'm labouring for the Lord's cause, preaching the righteousness of Christ and His precious blood, by which men's sins are washed away. What is JUDAS PRIEST accomplishing with their lives? They're leading people away from God and into all manner of wickedness and sin. But we as Christians are on a bright path which leads to life through the cross of Jesus. Jesus died, was buried and rose up from the dead. That's the gospel message! Believe it, make it your hope for Heaven, receive the gospel as full-payment for your sins and you will be saved. This world is the only Hell a Christian will ever suffer, and it's the only Heaven the Christ-rejecting wicked will ever enjoy. Anything that influences people for Satan is demonism. So I don't look for demons and red-tailed devils, Satan comes to us the Bible says with false teachings, sensual entertainers and the counsel of the ungodly. Sin City Las Vegas is demon city. Woe unto the wicked! I eagerly await the time when Jesus Christ will reign triumphantly from Jerusalem during the Millennium Period as King over the whole earth, and what a time of peace and righteousness that will be! Good bye Las Vegas! Good bye Mardi Gras! Good bye Hollywood! Good bye Broadway! Good bye Rock 'N' Roll! Amen!